Before I left for my holiday I was already informed what cake I would make for a wedding which was scheduled in late June. 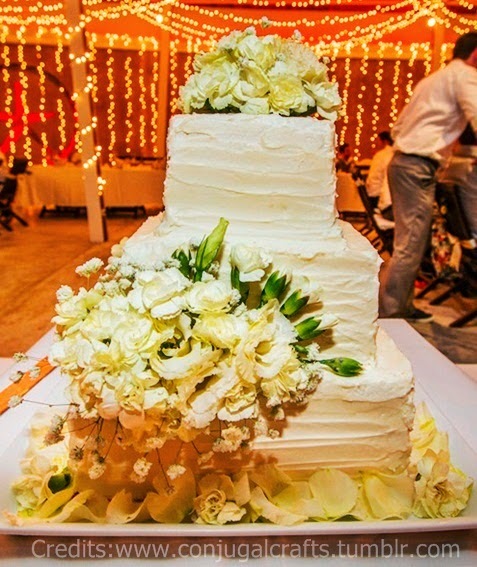 The couple liked the pale pink rustic round wedding cake I made a month early. The bride wanted similar design. She requested a square white chocolate mud cake in white butter icing. Easy but since I got back, the resort's occupancy has doubled. Meeting the demands is unbelievably difficult for me because I work alone. Given the amount of work I do now, I decided to bake ahead so I could give myself time to fix whatever goes wrong. I baked the cake a couple days in advance. Nothing went wrong. I was quite happy I made the exact calculation for the needed portion. It is a pain in the neck when the yield is less than what you need and you have to do everything again from scaling the ingredients to baking. I chilled the cake overnight as it is easier to work with it when cold. I did the icing and stacking a day early. The flowers were added right before serving.